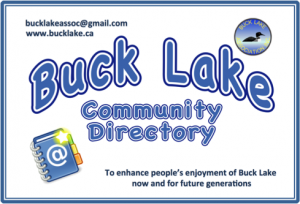 The Buck Lake Association has created a Buck Lake community email and phone directory for cottagers and residents in the hopes of helping create a more connected and caring community. The directory is circulated only to those Buck Lakers who supply their contact information for inclusion in the directory and is not to be used for solicitation or commercial purposes. Most Canadians are proud of our healthcare ‘system’, thinking it among if not the best in the world. There is no doubt that when you are seriously sick or injured you have ready access, especially here in southeastern Ontario, to medical and hospital care that’s first class. But let’s not be complacent. Our federal Minister of Health, Jane Philpot, herself a physician, pointed out in a speech in Kingston a few months ago that when compared to nearly a dozen other highly developed countries, healthcare in Canada ranked second from the bottom, not the top. To rub salt in it she also pointed out we were paying more per capita than most – a new car cost for a ride in a beater. It is painfully apparent that healthcare, an icon of what it means to be Canadian, needs work. Another thing that few Canadians know is that when it comes to optimizing the health of any population, healthcare services (hospitals, doctors, nurses, physiotherapists, the lot) contribute at most about 25%. For the most part the healthcare ‘system’ can be thought of as the equivalent of a transportation system’s repair shops. Like designing new cars, ships, trains, roads, airports, and teaching people to drive, all vital to a transportation system, fully 75% of people’s health is determined by the social environment in which they live. Having parents with good genes also helps but that influence pales when compared to the heavy-hitting power of the social determinants of health. You will be asking, “what has all this to do with Buck Lake?” The answer is “quite a bit, actually” once you understand that one of the most powerful of the social determinants of health is a supportive, welcoming, and inclusive community. Some of the others are education, especially in early childhood, housing, financial and personal security, regular, useful, challenging work, and being in charge of your own destiny, but being surrounded by good friends and neighbours who offer mutual support in good times and bad is a really significant determinant of good health. A welcoming, supportive, and inclusive community is what the Buck Lake Association is doing its best to support here in our little piece of paradise. That’s why we are putting so much of our volunteer time, effort and energy into the social side of our mandate, trying to make it enjoyably possible for everybody on the lake, permanent and seasonal residents alike, to meet and get to know everybody else. We all want to be healthy. Being part of and participating in a supportive Buck Lake community is an important way to get and stay that way.